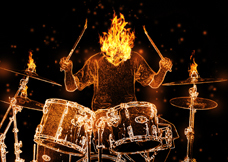 A Blast Beat is a drum beat that originated in Death Metal, and is often associated with Extreme Metal and Grindcore. It is utilised by many different styles of Metal. In Adam MacGregor’s definition, “the blast-beat generally comprises a repeated, sixteenth-note figure played at a very fast tempo, and divided uniformly among the bass drum, snare and ride, crash or hi-hat cymbal.” Blast beats have been described as, “maniacal percussive explosions, less about rhythm per se than sheer sonic violence”.